In school, the HowdaHUG is often used as a tool to help a child. Although it is always helpful to have more than one HowdaHUG available, the seat can be introduced individually into the classroom. Children are naturally curious and most will want the NEW seat. If possible, introduce a rotating “try it” schedule during free time or circle time. This will help to resolve the curiosity factor. In terms of introducing the HowdaHUG to a child who needs it for a therapeutic reason, it helps to introduce the seat as a “tool.” Just as some children need glasses to see, pencil grips to write, or other special tools to help them do their schoolwork or self-care activities, this seat can help a child be able to have more success in their occupation as a student. If you have specific questions about introducing the HowdaHUG for presentation, contact Leslie Novak at leslie@howdadesignz.com. Additionally, Howda Designz has a professional Occupational Therapist, Gloria Breton OTR/L, as a consultant, and will be glad to make inquiries for her professional advice. HowdaHUGs can be used on a variety of surfaces. They are a comfortable way to sit on the floor allowing for upright back support as well as rocking. They can also be used in many different types of chairs, including most school chairs. Ideal for bleachers, theater seats and the beach. We have even seen one used to adapt a sled! HowdaHUGs weigh 2 lbs, making them easy for small children to carry with them. HowdaHUGs are easy to roll up and carry along wherever you go. They can go from one classroom to the next, on fieldtrips, to restaurants, to concerts, to therapy sessions, or wherever they are needed. When rolled they provide their own carrying handle. They can be stored flat, taking up very little space in the classroom, at home or in the car. HowdaHUGs and (our HowdaSeats) are made of durable cotton canvas and American basswood. The Basswood is hardwood. This combination of material allows for the chairs to be lightweight, yet very strong. The HUG and HUG2 also have an extra layer of reinforcing vinyl on the bottom hinge to accommodate the aggressive rocking some children need. The HUGs allow for children to move while seated. Many children need to move in order to focus and have a productive flow of ideas. 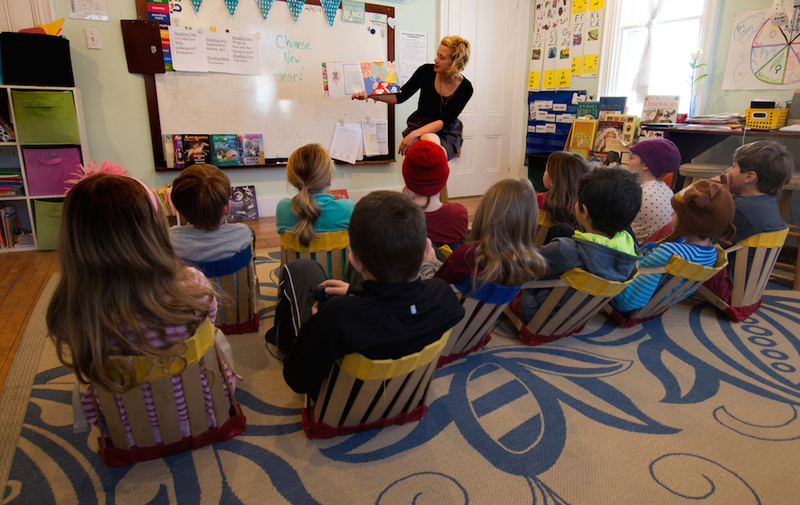 This seating alternative helps to promote a medication-free approach to the needs of children who benefit from movement during the school day. HowdaHUGs come in bright primary colors. The Petite seat is available in all red or all cobalt blue. The HUG 1 and HUG2 have a combination of red, blue or purple, and yellow or our new for 2018 calming colors, natural, olive green and cobalt blue. Know with confidence that HowdaHUG materials are both safe and environmentally-friendly. They consist of 100% cotton canvas and renewable American Basswood, the lightest of the hard woods. Another great feature, all HowdaHUG chairs are made in Maine, USA. To get into the HUG, sit on the floor, open the HUG, then slide back into the chair until your hips are flush with the bottom hinge. To get out of the chair, scoot forward out of the chair, fold the chair flat, roll onto your knees, hold the “closed” seat as a post to use as leverage to stand up. NOTE that the D-Ring buckles are hard to adjust on purpose. This, so the child will not “fidget” with them. Please see that a teacher or parent makes the appropriate adjustment. Gauge tightening the straps based on what the HowdaHUG is sitting on i.e. floor, school chair, couch, dining room chair etc., for the appropriate degree of comfort per individual child. It is best to be snug, but not so much that the child has to bend forward to sit up straight. The tightness (proprioception/deep pressure) is what is calming. The seat should also cradle them when they rock back in it, with legs bent at the knees and feet flat on the floor. HowdaHUGs are a great way to allow a child to move without being disruptive. One of the first things most children will do in their HUG is tip backwards, because they have not yet learned how to balance the chair. Most children will “fall” all the way back (and often enjoy sticking their feet up in the air). Tipping all the way back and coming back up independently or with assistance is a great core strengthening exercise that can be used during sensory breaks or therapy sessions. Once a child gets the hang of tipping back without falling over, she can learn to balance and rock comfortably. This can be very calming for many children and the movement is so subtle that is does not disrupt others during circle time. When rocking or balancing, the more a child pushes against the HUG, the more proprioceptive (deep pressure) input they receive. In order to reduce the possibility of injury, an adult should sit with a child the first time they try out the HUG. Sitting the child in front of a wall, a sturdy bookcase that will not tip, or a large floor cushion, will allow the child to tip back without getting hurt. The floor pillow is often the best thing to place behind a child because they can then tip all the way back and experience the sensation of “how far is too far” and “how do I problem-solve getting back up”. In addition to the HowdaHUG, Howda Designz makes two types of fleece liners for the seats. One is a cap that fits over the top edge of the chair. The other is a liner that hooks over the top and bottom edges and lines the whole seat (see photo). For children who want or need softer input or more of a cuddle sensation, the fleece liners are a great addition to the HowdaHUG experience. If a child needs additional deep pressure while in the HowdaHUG, we recommend using a weighted lap pillow. This type of weighted item will not interfere with how the HowdaHUG fits the child and gives even more comfort, especially if the lap pad is made with interesting material that the child can rub for tactile input. 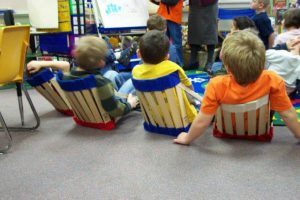 Many children who sit in regular school chairs constantly squirm and rock the whole chair backwards. Using the HUG in a school chair allows for rocking in the chair so that the chair itself stays stationary. This can greatly reduce the possibility of injury from tipping chairs and damage to chairs from falling onto the floor. To allow for rocking in the HUG on a chair, cinch the chair closed slightly more than the position of the HUG when used on the floor. Then place the HUG on the chair, but leave 3 or 4 inches of space between the back of the HUG and the back of the chair. This will allow the child to rock back slightly in the HUG on the chair, but will encourage the child not to tip the whole chair over. Gloria Breton, OTR/L is on staff with Howda Designz. As a consultant she offers expertise in working with special needs children and with HowdaHUGs in the classroom. Gloria attends conferences and expos nationwide. She is a sales agent as well as a spokesperson for the HowdaHUG in the classroom.